From the magnificent architecture and romantic atmosphere to the vibrant nightlife and excellent local beer, there are countless reasons to visit Prague. No wonder that, since the fall of the iron curtain, the Czech capital has become one of the most visited cities in Europe, rivaling such classic destinations as Rome, Paris and London. As a history buff, however, the main reason I love this city is its stunning medieval appearance. Largely (and luckily) spared from destruction during two world wars, Prague is rightly considered the most well-preserved large medieval city in Europe. It is true that there are more compact and intact medieval towns—Dubrovnik, for instance, with its state-of-the-art fortified walls—but none of them compares to Prague, a city of more than a million inhabitants. As soon as I set foot in the old town, I was overwhelmed by the amount of architectural marvels scattered around the cobblestone streets: towers, bridges, churches and palaces. If it wasn’t for the crowds of tourists who have replaced knights, priests, noblemen, merchants and commoners, I would definitely feel like I had been sent back in time. Dating back to the 12th century, the Old Town Square is encased by splendid historical buildings and towering gothic monuments such as the Church of Our Lady before Týn and the Old Town Hall, with its famous Astronomical Clock. 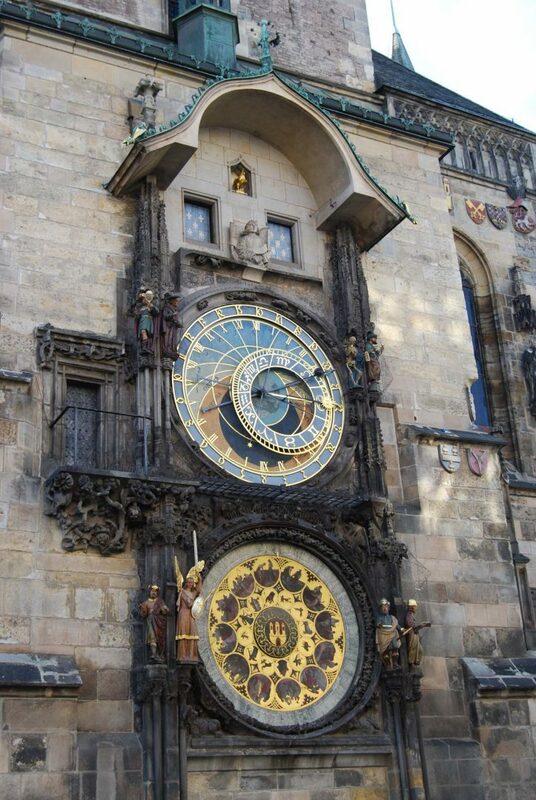 One of the oldest of its kind (built in 1410), the clock features a mechanism that, at every strike of the hour, shows a procession of the 12 apostles. Surely remarkable for the time it was made, frankly speaking, all you can see are 12 little figures nodding and turning through tiny holes in the clock. Yet, inexplicably to me, the show attracts thousands of people who, elbow to elbow, wait with their heads up to watch the show and walk away invariably disappointed. Sightseeing aside, the Old Town Square is the perfect place to hang out and people-watch: tourists, families, vendors, talented street artists and musicians animate the place day and night. The beauty of the old town is not limited to its main square. The whole area can be considered an open-air museum, packed with colourful houses, fine churches, museums and historic sights. 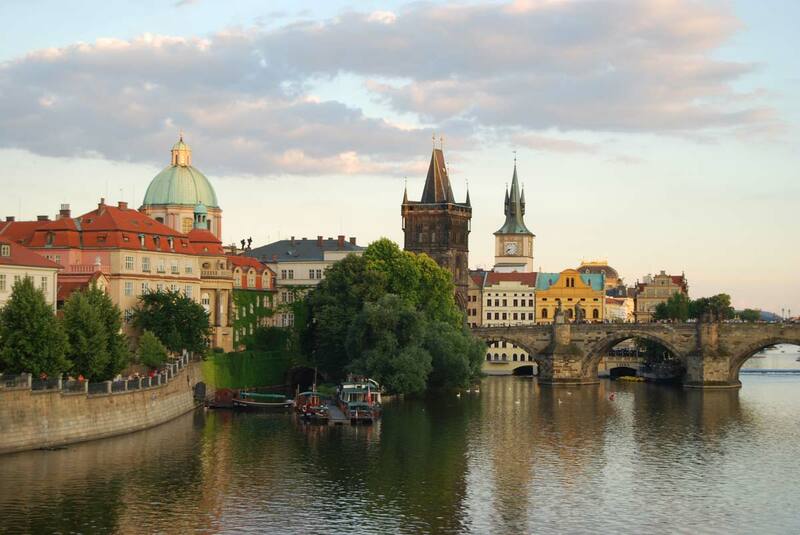 To render the scene even more charming, the Vltava River flows through the city, separating the Old Town from the Lesser Town (Mala Strana) and the castle. The rivers of Prague create endless perfect photo ops. Spanning over the river is the gothic Charles Bridge, which until 1841 was the only passage between the two parts of the city. Apart from its respectable 600-year age, Charles Bridge is one of the few surviving gated bridges in the world, guarded on both ends by three massive towers. What makes this bridge so special, however, are the 30 Christian statues lining the balustrades and the superb views of the castle and the old town it offers. During the day, the lure of the place is a bit spoiled by throngs of pedestrians, vendors, painters, buskers. For this reason, I only managed to really appreciate it at night, when the crowd had dispersed and the lampposts were lit. Only then I could see the magic come alive and let myself be enraptured by the romantic scene. 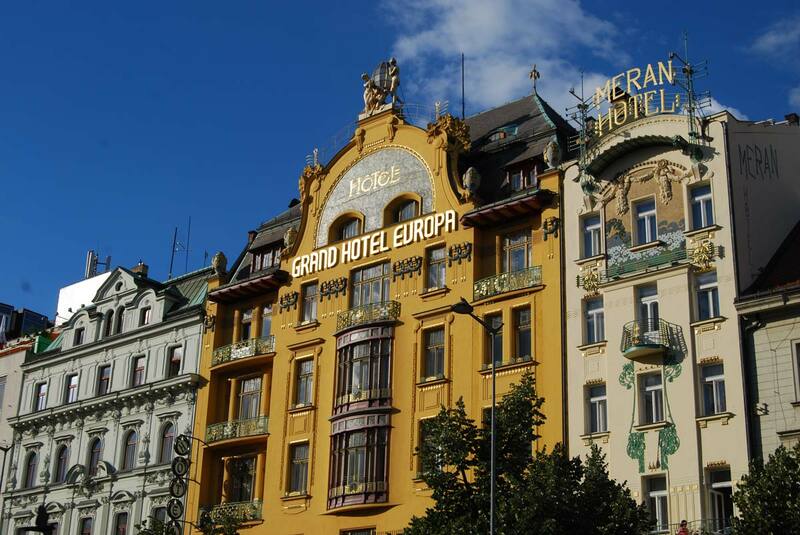 Prague’s classical architecture is unbeatable in Central Europe. 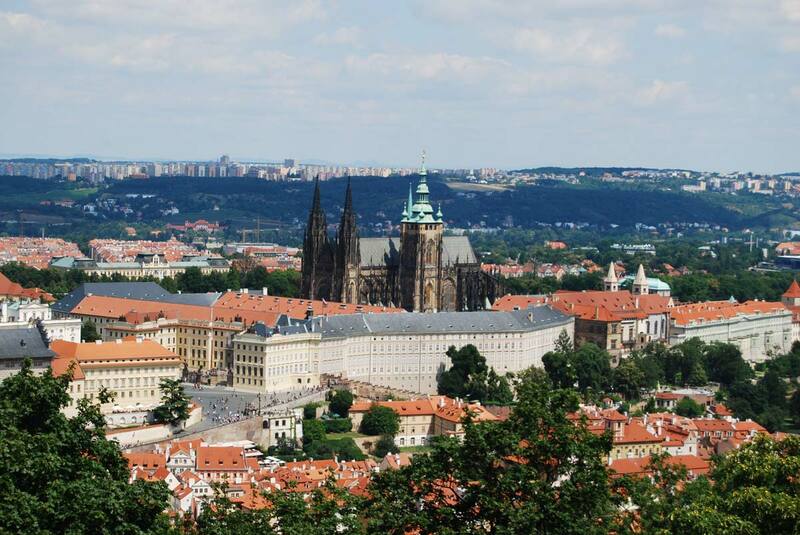 Prague’s other major attraction is its majestic castle, rising atop a hill in Mala Strana. Founded in the ninth century, it developed over the centuries from a modest wooden fortress into the largest ancient castle in the world, covering an area of more than 70,000 square metres—a bit over 13 NFL fields. For centuries the castle has been the seat of Czech kings and queens, who have expanded and adjusted the structure, conferring it the heterogeneous appearance it has today. The vast complex comprises gardens, ramparts, towers, churches, art galleries, museums, palaces and government buildings. Given its huge size, an entrance ticket is valid for two days, giving visitors enough time to appreciate it all. 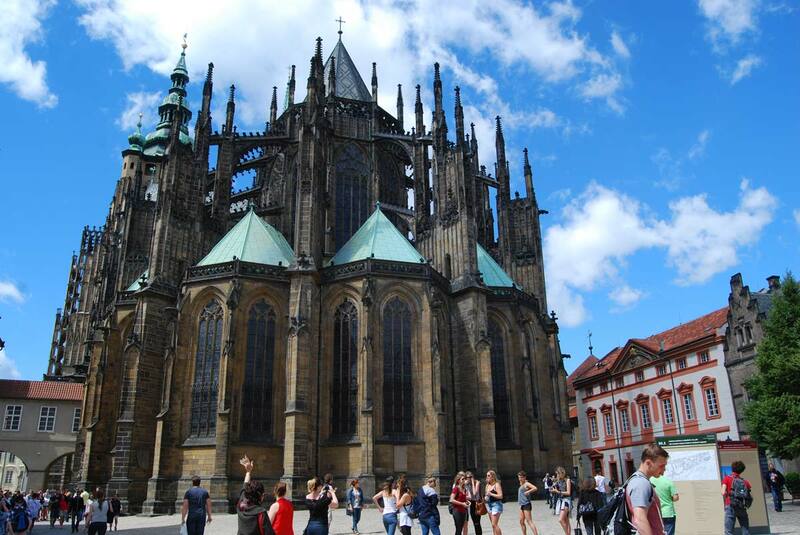 Prague’s medieval St. Vitus Cathedral, as stunning a example of Gothic piety. To me, the highlight of the castle was the St. Vitus Cathedral, with no exaggeration one of the grandest religious buildings I’ve seen in my life. While the size of the church itself is awe-inspiring—you can spot its silhouette from nearly anywhere in Prague—it was the interior that left me speechless, lavishly decorated as it is with colourful glass windows, bright frescoes and incredibly elaborated sculptures. Such pomp is explained by the fact that the temple was used for the coronations of Czech rulers and the burial of saints, noblemen and archbishops. A very fascinating sight of the castle is the Golden Lane, an old narrow street created during the construction of the northern wall in the late 15th century. Seemingly built for dwarfs, the picturesque, tiny houses lining the Golden Lane were actually destined to host the marksmen of the castle and their families. Later, Franz Kafka lived on this street for a couple years; today they display textiles, handicrafts, souvenirs and armoury. 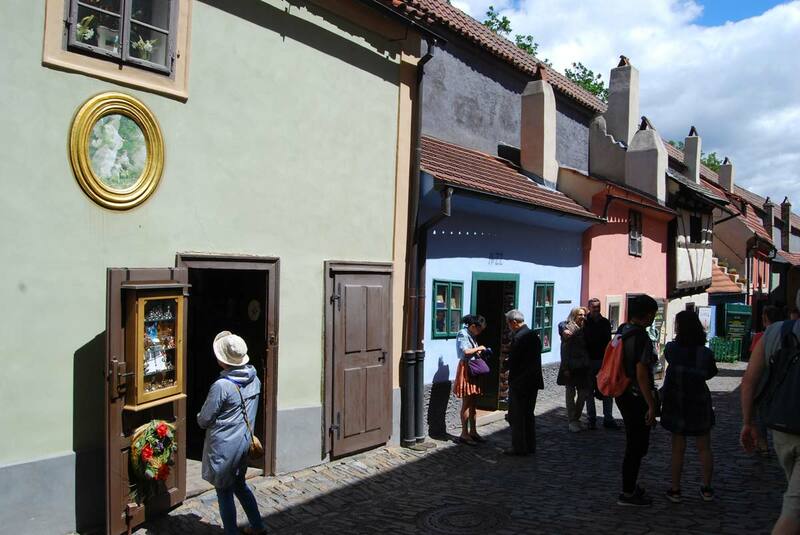 Golden Lane, a picturesque tucked-away street in medieval Prague. It is impossible to summarize Prague’s medieval life in so few words. There are, of course, the spectacular vistas over the city: a vast expanse of red pitched roofs, imposing towers, church spires and domes, quaint bridges, walled courtyards and parks. It is a view that reminds any visitor of the myriad lives that have lived here, as well as those who are lucky enough to still enjoy one of the most beautiful cities in the world. It’s a view that will stay with me for a long time.